In this second archive story by Kristian Bertel, we see a blue and vivid scenery of the city of Jodhpur in Rajasthan, India. Glorious Mehrangarh fort mushrooms from beneth a huge rocky cliff to dominate the once indomitable blue city. At dusk you feel a part of a real-life movie, as the camera-shy palace peeks over awesome stone walls, and citizens mill about in the hemmed-in chaos below. 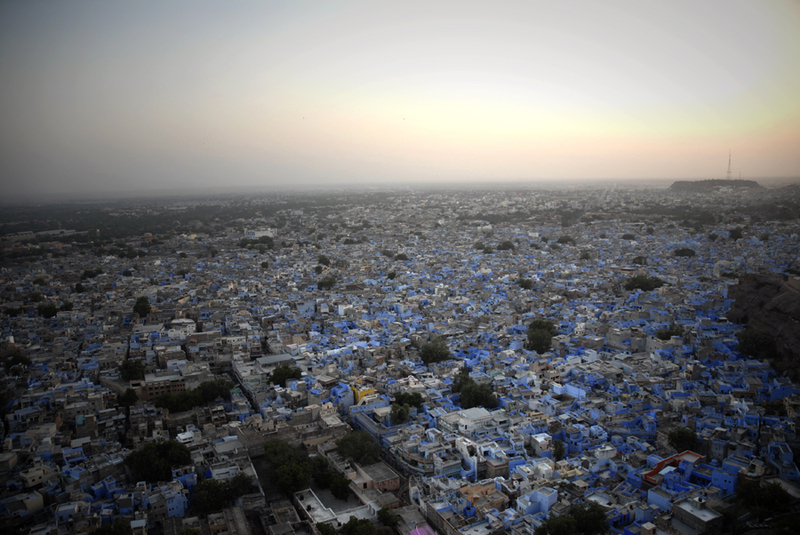 This photograph depicts the blue scenery of the city of Jodhpur in Rajasthan, India. Jodhpur proper stretches beyond the 16th-cenury border, but it is the immediacy and grandeur of the old city, once a stop on a vital trade route, that has more and more travelers raving. Mighty Mehrangarh, the muscular fort that towers over the blue city of Jodhpur, is a magnificent spectacle and an architectural masterpiece. From here you a spectacular sight and scenery of the blue city in India. Around Mehrangarh's base, the old city, a jumble of Brahmin-blue cubes, stretches out to the ten kilometer-long, 16th-century city wall. The blue city really is blue. Inside is a tangle of winding, glittering, medieval streets, which never seem to lead where you expect them to, scented by incense, roses and sewers, with shops and bazaars selling everything from trumpets and temple decorations to snuff and saris. Traditionally, blue signified the home of a Brahmin, the photographer learned, but non-Brahmins have got in on the act too. As well as glowing with a mysterious light, the blue tint is thought to repel insects, the photographer also learned. When visiting this extraordinary city with all the shades of blue colors it is aslo very clear as a photographer to see that Jodhpur is a historical city. A historcal city whose origin dates to the year 1459 AD when it was founded by Rao Jodha, the Rajput chieftan of the Rathores. The Rathore kingdom was also known as the Marwar and was the largest in Rajputana. The city was built as the new capital of the state of Marwar to replace the ancient capital Mandore, the ruins of which can be seen near what is now the Mandore Gardens. The people of Jodhpur and surrounding areas are hence also commonly called as Marwaris. Jodhpur is also known as the blue city, and therefore the name, as the most houses in the old city are shades of blue. This is particularly noticeable on the north side of the town, known as Brahmpuri for the many Brahmins that live there. The forts and palaces, temples and havelis, culture and tradition, spices and fabrics, color and texture, a booming handicrafts industry, all add up to make this historic city worth a visit. Modern Jodhpur stretches well beyond the city walls, but it's the immediacy and buzz of the old Jodhpur's blue city and the larger-than life fort that capture travelers’ imaginations. This crowded, hectic zone is also Jodhpur's main tourist area, and it often seems you cannot speak to anyone without them trying to sell you something. Areas of the old city further west, such as Navchokiya, are just as atmospheric, with far less hustling. India is a land full of stories. On every street, on every corner and in the many places in India, life is rushing by you as a photographer with millions of stories to be told. In the archive story above, you hopefully had a readable insight in the story that was behind the photo of the blue city in Jodhpur. On this website of Kristian Bertel | Photography you can find numerous travel pictures from the photographer. Stories and moments that tell the travel stories of how the photographer captured the specific scene that you see in the picture. The photographer's images have a story behind them, images that all are taken from around India throughout his photo journeys. The archive stories delve into Kristian's personal archive to reveal never-before-seen, including portraits and landscapes beautifully produced snapshots from various travel assignments. The archive is so-far organized into photo stories, this one included, each brought to life by narrative text and full-color photos. Together, these fascinating stories tell a story about the life in India. India, the motherland to many people around the world, a land of unforgetable travel moments. The archive takes viewers on a spectacular visual journey through some of the most stunning photographs to be found in the photographer's archive collection. The photographer culled the images to reflect the many variations on the universal theme of beauty and everyday life in India. By adding these back stories the photographer's work might immensely enhanced the understanding of the photographs.